Two people were injured in an explosion at the Sioux City Landfill. 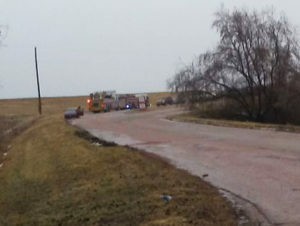 Two people were hurt in an explosion at the Sioux City Landfill Thursday. Fire department investigators say a buildup of methane gas may’ve led to the explosion in a building at the landfill. The explosion happened just after noon, and two men who work for Gill Hauling which runs the landfill were taken to the hospital with injuries. They were later transferred to a Lincoln, Nebraska burn center. Those on the scene say their injuries do not appear to be life-threatening. The landfill is closed while the damage to the building is assessed and investigators continue trying to find the cause of the explosion.